How can I start recording my vocals? Do you like to sing? Do you find yourself singing along to your favorite songs and think you might even sound better than Beyonce sometimes? Why not take your first dive into recording that song with her voice canceled out and your voice in its place, along with cool effects to make you sound even better??!!! IK Multimedia’s iRig Voice microphones. Low-cost, fun and flirty colors, made for beginners of recording vocals and karaoke stars! IK Multimedia’s EZ Voice is a free app from the App Store, or Google Play store, that will let you import your favorite songs right from your sound library, then you can cancel the “voice” of the singer and sing over it, using cool effects like the pros use, called “delay, auto-tune and reverb”, record yourself, and then send it/share it with a friend or to SoundCloud. Cool right? EZ Voice, a free karaoke and recording app with tons of features, and easy-to-use. 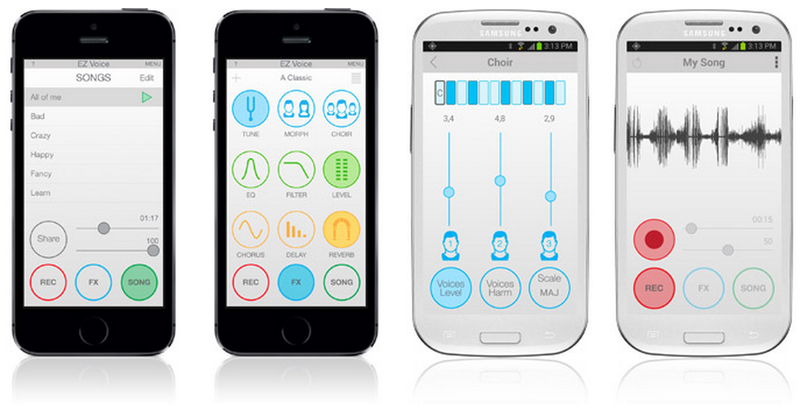 How do you get the sound into your iPhone, iPad, iPod touch or Android device? 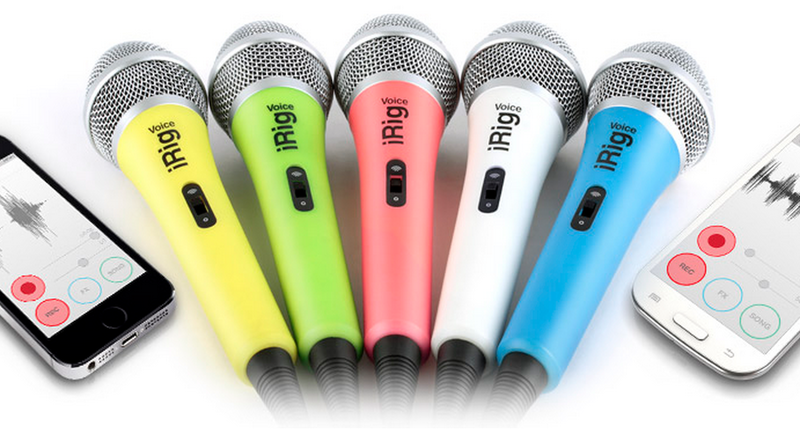 The iRig Voice microphones are low-cost, fun and flirty, and come in 5 colors, just the same as the iPhone 5c. They are just $39 from your favorite music or electronics retailer (or from the IK Multimedia online store). 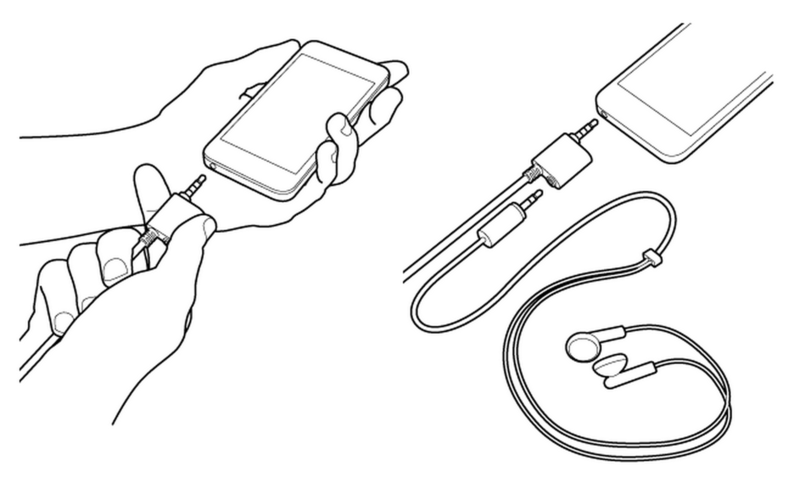 Plug this microphone into the audio jack of your device (where you plug in your headphones) and you can plug your headphones into the separate audio output on the iRig Voice’s cable. This way you can hear yourself singing, or you can output the sound to computer speakers (using and 1/8th inch to 1/8 inch cable) and hear yourself out loud. How to plug in iRig Voice, and output to headphones or speakers. Check out this video of people singing with the iRig Voice and EZ Voice combo. Looks like a lot of fun, right? For more information about EZ Voice and the iRig Voice microphones, please visit the IK Multimedia website. Click here. ~ by Starr Ackerman on July 16, 2014.